If done right, an accent wall is a great way to liven a room in your house. One of the best ways to add a little splash of color to a room is through an accent wall. Many homeowners are afraid to be bold and paint a room more than one color. If done right, an accent wall is a great way to liven a room in your house. It will grab your attention and direct your focus onto a specific area of the room. If you are thinking about making an accent wall in your home, consider the following tips! If you decide to add an accent wall into a room, you almost need to have some kind of wall decoration on it. Whether it is a painting, a mirror, or shelving, you typically don’t want to ever leave an accent wall bare because it is the focal point of the room. Although you want to be bold with your accent color selection, be sure to choose a color that is complementary to your existing color scheme. If you neglect to do so, you run the risk of your colors clashing. 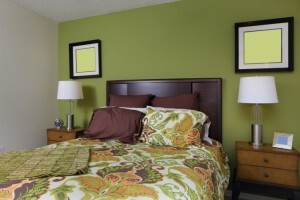 Before you decide on a paint color for your accent wall test your paints on natural and artificial lighting. It is important to realize that some colors work better in natural light than artificial light.